eTouchPoint recently released several high-value enhancements throughout its customer experience (CX) platform. The latest feature release is built around client enhancement requests and demonstrates eTouchPoint’s ongoing commitment to evolving its solutions to stay ahead of CX industry trends and provide advanced CX functionality for client users. 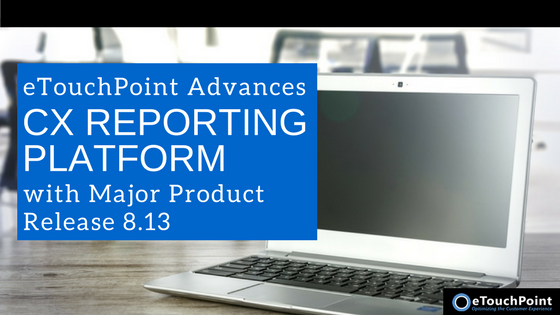 The 8.13 eTouchPoint Release includes important changes to the Dashboard, Reporting, Action Alerts, and Customer Verbatims modules, as well as the introduction of a new module (Survey Definition). Key enhancements across the eTouchPoint platform include the introduction of advanced search capabilities that give users a powerful tool to access customer feedback and trends. The new release also includes critical Dashboard presentation enhancements that allow users to track and visualize CX information, along with important enhancements to support improved data export capabilities. eTouchPoint also made refinements to software and hardware to optimize performance and security. One significant area of new functionality introduced in Release 8.13 is the addition of the CX Survey Definition module. This new module highlights survey campaign parameters around survey alerts, “perfect” scores, and company goals for all CX metrics. The initial release of the Survey definition module sets the foundation for future administration features around CX survey configuration and self-service capabilities. To meet the evolving needs of the CX industry, eTouchPoint completes an average of 250 product enhancements each year across 4-6 major release cycles. Release 8.13 represents the most recent advance to eTouchPoint’s suite of CX applications that have been in use at Fortune 100 leaders for almost two decades.